Lux Illuminaire is the innovative architectural lighting manufacturer of some of the most popular linear luminaires on the market. Throughout the years, they have crafted some of the industry’s most loved linear fixtures. Today, that same level of inspiration exists, and has taken new shape in energy efficiency and integrated controls! The LUX family of Luminaires is easily recognizable for its unique “X” form, displaying an inverted triangle floating above its counterpoint. The LUX luminaire gives intrigue and an element of surprise to an otherwise typical form factor. LUX linear luminaires are available as direct, or direct/indirect lighting types, in pendant mount only. The EOS family of luminaires consists of 2 inch and 3 inch recessed perimeter beams of light to surround a space in evenly distributed, high-quality, energy efficient light. Comprised of extruded aluminum and made from 90% recycled material, EOS products produce up to 105lm/W, at 80CRI, and includes an option for a superior 90CRI. EOS fixtures are available in direct, direct/indirect, recessed, wall graze, asymmetric, surface mount, and pendant. Lux Illuminaire’s LUX and EOS products pair quality name-brand LED chips and boards to ensure the color consistency while providing even and smooth illumination throughout each luminaire. Fixtures are available in 3000K, 3500K and 4000K color temperature with a minimum 80CRI and 90CRI, available upon request, as well as standard 0-10v dimming. Providing endless capabilities for a multitude of applications, both the LUX and EOS family of fixtures comes in standard lengths of 2’, 3’, 4’, 5’, 6’, 7’, 8’, and continuous row configurations. Continuous rows are joined together onsite with a provided simple to connect, joiner kit. 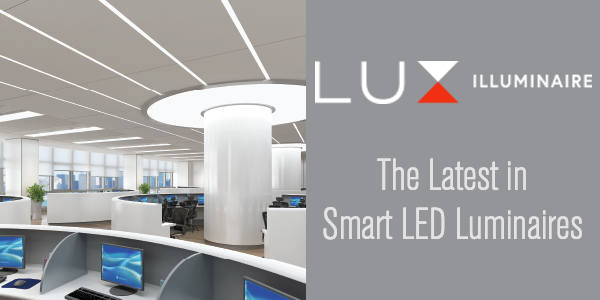 Lux Illuminaire understands the needs of the modern lighting application, which is why they offer an optional white color tuning- from 2700K to 5000K. As today’s market demands high quality lighting and energy efficiency, Lux Illuminaire has collaborated with Lutron Electronics to create options for Lutron’s trail-blazing VIVE wireless controls. VIVE is a wireless commercial controls solution to help contractors stay on budget, and on time, while instantly meeting strict energy codes. Specification options include VIVE’s RF fixture control, or RF with daylight and occupancy built in. The VIVE options are part of Lux Illuminaire’s “10-day Quick Ship” program, to get products out the door, and on the job site faster than ever. Lux Illuminare also offers Lutron integrated control options for EcoSystem. Lutron’s EcoSystem technology is a control method for LEDs luminaires that enables addressing of individual fixtures and status feedback from the LED drivers. Allowing contractors to digitally assign occupancy sensors, daylight sensors, time clocks, and more, to one or many fixtures without complicated, and oftentimes time-consuming wiring. For more information on these new products, download the brochure (below), or contact your local ERW sales rep, or email orders@erwlighting.com.